When registering a death you’ll need to make an appointment at a Registrar’s Office, and take with you various documents (we’ve listed them below). You might wish to take a friend or family member with you for support when you do this – if there is no-one who can go with you and you don’t want to go alone, speak to us and we’ll arrange for someone to accompany you. Please be aware that the registration process may vary – for example, if a death has been referred to the Procurator Fiscal – we’ll guide you through things if this is the case. 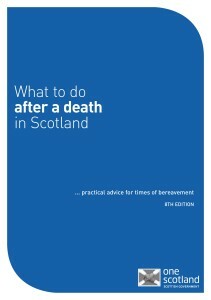 You may find the information booklet below useful.